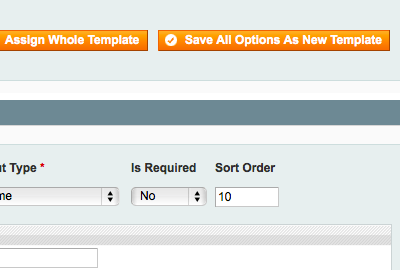 If some of your Magento products have identical custom options, why not re-apply them across your inventory? Our Magento extension allows you to do just that. You can mass-assign products to a template. 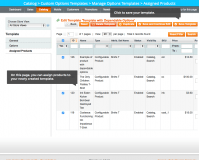 Why Use Magento Custom Product Options Templates? 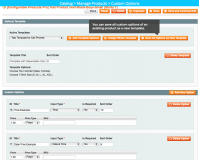 Easily apply your set of custom options to any number of products. Create dependencies between Magento custom options and their values. Make a template based on existing product’s custom options. Thanks to the extension, merchants can make the process of choosing and ordering the required items really easy and fast. Usability elements like a drop-down menu or intuitive icons contribute to a better ecommerce UX, allowing customers to select the product options they need in a convenient way. 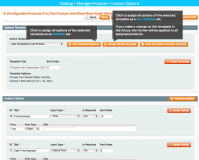 There’s no more need to spend thousands of man-hours inputting product options manually. 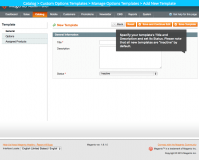 Leveraging the module, Magento admins can create new options templates with necessary product attributes within minutes. These can be later on applied to as many products as needed, significantly reducing the efforts and accelerating the entire process. With a variety of product configurations in place, it gets harder to keep track of the inventory. Custom Product Options extension provides for an ability to monitor product with multiple attributes by their SKUs, resulting in a more effective and accurate inventory management and control. 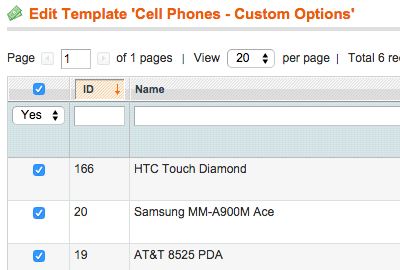 Create templates for groups of custom options for Magento. 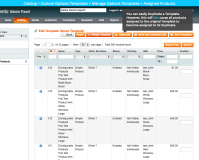 Mass-assign Magento products to templates. Apply a template when creating/editing a product. Create dependencies between custom options and their values. Apply a template as a whole - this way, a change in the template will cause changes in all assigned products. Apply a template as a set of editable options - this way, if you make changes to one product, this won’t affect other products that have this template. 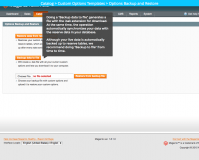 Back up and restore custom options or templates created with this extension. Compatible with Magento Custom Product Preview extension for Magento. 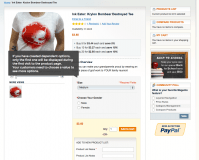 Compatible with Magento Shopping Cart Editor extension for Magento. Magento Product Options for Grouped Products extension – Select the necessary modifications of products in groups. 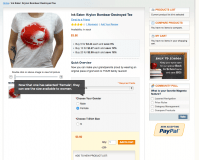 Magento Web-to-Print extension – Allow buyers to personalize your products with pictures, clip-arts and text objects. Upload a gallery of images and fonts to choose from, select any number of customizable areas, and change the prices of custom-designed goods. 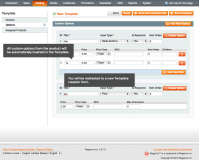 Magento Product Units plugin – Localize your store by selling products in units and quantities customers are used to. Magento Configurable Product extension – Automate the process of creating simple associated products for configurable goods. Magento Product Visual Attributes extension – Make your product page eye-catching by using visualizations instead of a plain text. Upload icons, images and colors and change text descriptions to the corresponding objects automatically. * Fixed a JS error in browser console on product page. * Fixed the issue with custom options saving as a template on a product edit page. * Fixed an issue dependencies of radio button options. * Fixed 404 error when clicking on button "Save All Options as New Template". * Fixed the missing dependencies column. * SQL error when saving template is fixed. * Fixed the issue with slow performance during the product saving. * Fixed the issue with template saving when there a lot of products in magento. 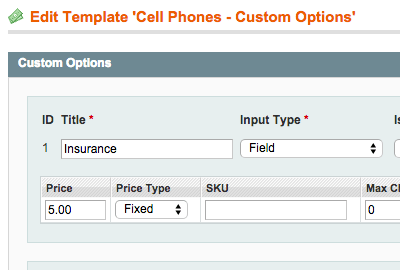 * Fixed dependent options issue with Custom Product Preview. * Fixed the SQL error when installing module. * Issue with max_input_vars detection is fixed. + Compatible with Shopping Cart Editor v.2.1.4 +. * Fixed the issue with displaying dependable custom options not assigned to template on grouped product page. * Compatibility fix with 'Custom Options for Grouped Products extension. + Additional server checks are added to prevent data loss or corruption when saving custom options. * Compatability bug with Custom Product Previewe is fixed. * Fixed bug assigned products not being saved. * Fixed bug with impossibility to add children values to custom options. * Fixed bug with deleting of values in some cases. * Fixed bug with impossibility to duplicate product. * Fixed compatibility bug with Multi Location Inventory. * Fixed the error when duplicating the template. * Fixed the error when saving the template. * Fixed compatibility bug with Custom Options Templates and Multi-Location inventory. + Ability to create dependencies between custom options and their values. * Fixed bug with inability to save a new template. * Compatibilty fix with Front-end Editor. * Fixed bug with file upload in custom options templates. * Fixed issue with displaying of the hidden module's default product. * Fixed issue with placing Order with bundle product. * Compatibility fix with Custom Product Preview Extension. * Incorrect restoring of the options' Price and Price Type after backup applying is fixed now. * Issue with error telling "Please specify the product's option(s)." when adding products to cart, which don't contain required option(s), is fixed now. * Fixed incorrect saving of required options in Templates. The fix solves problems with ajax shopping carts. * Fixed SQL error when saving template without associated products. * Fixed SQL error with required options. 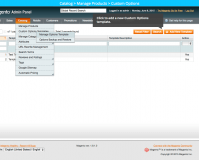 * Fixed mass assign of templates to products. A template can be assigned to max of 4200 products at a time. * Fixed compatibility with Pre-Orders Extension. * Fixed crash when going to create a template right after the Extension's installation and without refreshing the cache. 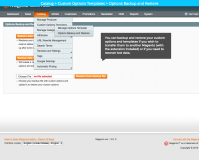 + New backup and restore functionality for custom options and templates that were created with the help of this extension. * Bug with saving custom option labels for non-default store view. We have lots of products with the same custom options. This extension saves us a lot of time. Now we can easily add or modify options for all our products at once. Extension had a little conflict with another 3th party extension, developer solved this very quick. Keep up the good work! I've used Aitoc modules for around 5 years now and have to say I am very impressed, both with their modules and with their support. The Custom Option Template Module is exactly what I needed - My products have around 500 options EACH! - can you imagine adding that lot manually to every product in Magento!! I needed a hand to get it to work how I wanted it to. I paid my support fee and within a couple of hours it was done. Really can't recommend the Aitoc Team highly enough. They have also done 2 lots of custom development for me - again completed quickly and accurately. I needed this module to fulfill my client needs. Aitoc has great customer support when I needed to understand how the module works. 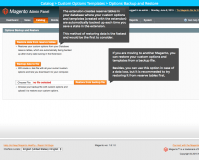 Since we migrated our Magento set-up to a new server, we have an issue with the display of custom options. We contacted support and within 48 hours the problem was solved with 0.5 hour support. Very quick, helpful and supportive. A big thank to support team. Awesome extension, especially for this price. We installed it on a Multistore (v. 1.7.0.2) and had some issues with saving product information. But the support was extremely helpful and we solved the issue pretty fast. Now everything is working perfectly! I really recommend this extension! This module was just what we needed plus the developer provided us with all the help we need. Very fast response to our support tickets. It's really nice extension and Aitoc developer giving me awesome support Service. thanks a lot ..
One of the must-have extensions for sites with many product options. Saves a lot of time and it's definitely worth the money. Needless to mention Aitoc's stellar support. I really recommend this module. Had some difficult to make it works but the support was very good. We currently use 10 seperate AITOC modules, and a handful from other vendors. 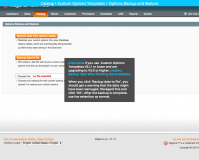 If there is one extension our business could not live without, it is the custom options template. We mostly sell personalized or customized products (about 3,000 SKUs) and maintaining that amount of SKUs would simply be impossible without this module. As far as the module itself, it is easy to use, and it works with some custom options code AITOC wrote for us. We can change price and options for entire types of products with just a few seconds! I have seen mixed reviews of AITOC, but my biggest beef with them is that they don't have more even modules to solve my problems. They are a great company with some great products to Magento. I had a problem and has put its full potential to help solve it. They are highly recommended. This is a must have extension. Should have been native in Magento but wasn't. Support is fantastic! 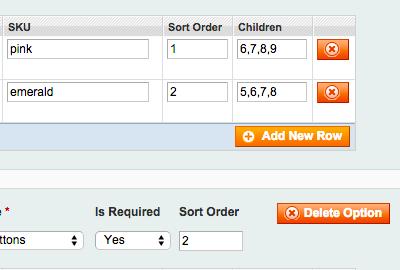 Great time saver, smooth integration, feels like it should have been like this in Magento all along. PROS: Very handy mod for your Magento install. If many of your products use the same options then this will be a huge time saver ... especially if you have to update the options. CONS: The only downside (at the time of this posting) is that it does not support multiple websites on a single install. Therefore, if you have a product that is using the option template then that will be applied to the product on every website. That may not be a huge deal for most but in our case it is.